Intrepid Ideas: MacGyver - Like! Too funny! I tried every kind of glue, caulk type gunk and adhesive to reattach the decorative top on the sink faucet. Everything failed. So, I chewed up some gum. Yep, it's held fast. True story. This is hysterical, love your post !!! Thanks so much for stopping by and thanks for the great comments. Please come back again. 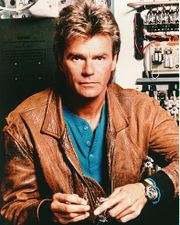 ohh man, i loved macgyver as well. in fact, i was much like him way before his time on the toob. hehe! well i started typing my own personal macgyver story here and it just got too long. LOL! so, one day this week i'm gonna post it on my blog. its just too funny not too! hehe!! Lovely post! As a kid, I love McGyver too. And tried fixing up things or make innovative inventions around the house. Quite a surprise to my parents because I'm a girl. Now, I think mythbusters is proving McGyver wrong. It's like telling a kid there is no Santa! California Fires - Under Control?